Going shopping seems like so much fun doesn’t it? Or just taking a walk in the mall or park? How about going to a movie and parking in the north 40 and walking to the box office? No problem, right? But for many of us with conditions that prevent our walking, it’s a BIG problem. There are people with heart conditions, lung or other problems, who cannot walk more than a few feet. They need the aid of a medical mobility scooter, just as much as someone with a visible need, such as loss of limbs or a disease that prevents ambulation. I’m one of those people. Without my scooter or a wheelchair I can’t walk enough to shop. I can’t even get from the car to the store, and certainly can’t walk through the store doing shopping. 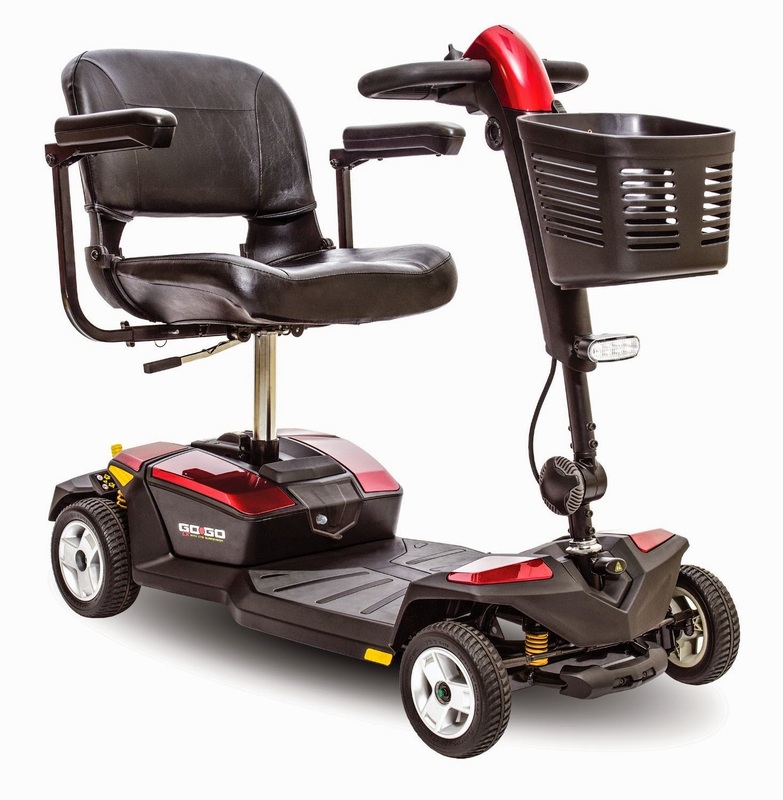 When I got my first medical mobility scooter, it was provided by the Veteran’s Administration, and they put a lift on the back of my big Cadillac so that I could take it anywhere I wanted to go. I called it my “Harley Piglet,” and it was wonderful. But as years went by and I grew older, I became more insecure about driving in the traffic in my big, busy city. I returned the scooter and lift to the VA, gave the car away to my daughter, and bought my own scooter. This scooter was a whole new experience, because it came apart into four pieces and could be placed in the floor of our van. The heaviest piece only weighs 32 pounds. Putting it together when we arrive somewhere is simple. The bonus is that it comes in Red and Blue, and since RED is my favorite color it was perfect for me. (Little pleasures like that DO mean a lot to an old person! haha!) Without a lift on the van, we were spared giving up space for groceries, shopping, and my converter and extra oxygen when we travel. The Go-Go Ultra Four-Wheel, since it comes apart, takes up little space and solved that problem handily, making it possible for us to stow and go. It’s simple to take apart and put together, and we never go anywhere without it. The day we bought my Go-Go, we looked at various styles and decided on a four-wheeler because we love to travel and go to parks, so since we are not always on a paved surface, stability was a great concern. The gentleman at the store told us the three-wheelers are good, and are actually preferred by some, but for added stability the four-wheeler was best. Of course, it cost a little more too, and I’m sure that was a factor in his recommendation! But we agreed that it made sense that four wheels would be steadier than three. Besides that, it was still cheaper than having some sort of lift put on our van. Taking that into consideration, plus the added convenience of the extra space in the vehicle, it made sense to buy the 4-wheeler. We have never been sorry. It has never turned over with me, and we’ve been on some rocky and rough terrain with it! We went to see a movie recently, and if you’ve been to one lately, you know that there are numerous theaters showing different movies in the same building. Walking all the way from the car into the theater, then all the way to the door where our film was shown (always seems to be the last one in the place!) would have been impossible for me without my scooter. Now I glide through the door of the theater feeling great, because no matter how far our theater is, I can get there with ease. Translation: I can once again do a simple, normal, ordinary thing, like go see a movie! Some Insurance or Medicare Plans Cover Medical Mobility Scooters, if your doctor prescribes it for you. If you or someone you love, has a medical mobility problem, please check with your Medicare or Insurance provider to see if one will be provided. But be sure to ask specifically about the Pride Go-Go Ultra for the convenience it offers, sparing you the expense of installing a lift on your car. When we go on a trip where we know the scooter will get a lot of use, we take along extra batteries. The GoGo makes travel so much easier. While we’re out running around sightseeing, we take an extra battery with us, while fully charged ones are ready and waiting in our room. When we return, we change out the spent one, put it on charge and never lack for the ability to go when and where we want to. The batteries DO last a long time but it’s good to have extra batteries ready for all those little interesting side trips you might find. Besides the batteries, there are accessories you might need too. The front basket is small and only suitable for light items. However the rear basket works very well for heavier items; groceries, oxygen tanks, and so on. There’s also a rear view mirror to help you stay safe and of course, a cup holder to help you stay hydrated with your favorite drink while you’re on the go. All of these things are available at this link from Amazon. No need to have to go out to go shopping. There are other models in the Pride GoGo Scooter. Mine is the Ultra, but there’s also the Sport version shown here, which is shown as a 3 wheel. Nancy, this is an excellent review of your GoGo Scooter, full of helpful information for anyone looking to buy a mobility device. So happy for you that you’re able to get around easily with a scooter that seems to have everything that you need. Thanks for the information!